Stopping male mosquitoes from sealing their sperm inside females with a 'mating plug' could prevent mosquitoes from reproducing, and offer a potential new way to combat malaria, say scientists publishing new results in PLoS Biology on 22 December. The new study focuses on the species of mosquito primarily responsible for the transmission of malaria in Africa, known as Anopheles gambiae. These mosquitoes mate only once in their lifetime, which means that disrupting the reproductive process offers a good way of dramatically reducing populations of them in Africa. When they mate, the male transfers sperm to the female and then afterwards transfers a coagulated mass of proteins and seminal fluids known as a mating plug. This plug is not found in any other species of mosquito and until now, very little has been known about what it is for and the role it plays in An. 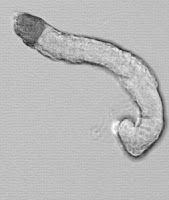 gambiae reproduction. The authors of today's study, led by Imperial College London, have shown for the first time that the mating plug is essential for ensuring that sperm is correctly retained in the female's sperm storage organ, from where she can fertilise eggs over the course of her lifetime. Without the mating plug, sperm is not stored correctly, and fertilisation cannot occur. In Imperial's mosquito labs, the scientists showed it was possible to prevent the formation of the plug in males, and that this stopped them successfully reproducing with females. "We have shown that the male mating plug is not a simple barrier to insemination from rival males, as has been previously suggested. Instead, we discovered that the plug plays an important role in allowing the female to successfully store sperm in the correct way inside her, and as such is vital for successful reproduction. "Removing or interfering with the mating plug renders copulation ineffective. This discovery could be used to develop new ways of controlling populations of An. gambiae mosquitoes, to limit the spread of malaria." Dr Catteruccia and her colleagues analysed the composition of the protein-rich mating plug and discovered that it is formed when an enzyme called Transglutaminase interacts with other proteins in the male mosquito's seminal fluid. This interaction causes the seminal fluids to coagulate into a gelatinous solid mass. When the research team knocked out this enzyme in male mosquitoes in the lab, the fluids failed to coagulate and form the plug. Furthermore, when these males, lacking the key protein and therefore the plug, mated with females, reproduction was not successful. Dr Catteruccia concludes: "If in the future we can develop an inhibitor that prevents the coagulating enzyme doing its job inside male An. gambiae mosquitoes in such a way that can be deployed easily in the field – for example in the form of a spray as it is done with insecticides – then we could effectively induce sterility in female mosquitoes in the wild. This could provide a new way of limiting the population of this species of mosquito, and could be one more weapon in the arsenal against malaria."